I just came home (okey, for about a week ago anyway) from eight days of vacation in Gdansk/Sopot. Sopot is The seaside resort in Poland and apparently the most expensive place in Poland as well. In Norway that translates to restaurants/cafe prices is cut in half, beer is even cheaper. 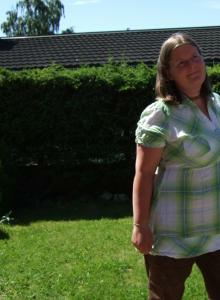 Surprisingly, clothes etc wasn’t that much cheaper than in Norway. The days were spent walking, eating and drinking. Preferrably, walking from one cafe/restaurant to another. I wish I had taken a picture of every meal we ate, it would have been funny to have a complete record of all the meals we had. We had rented an apartment in Sopot, and in the town there was a chocolate cafe I fell in love with. 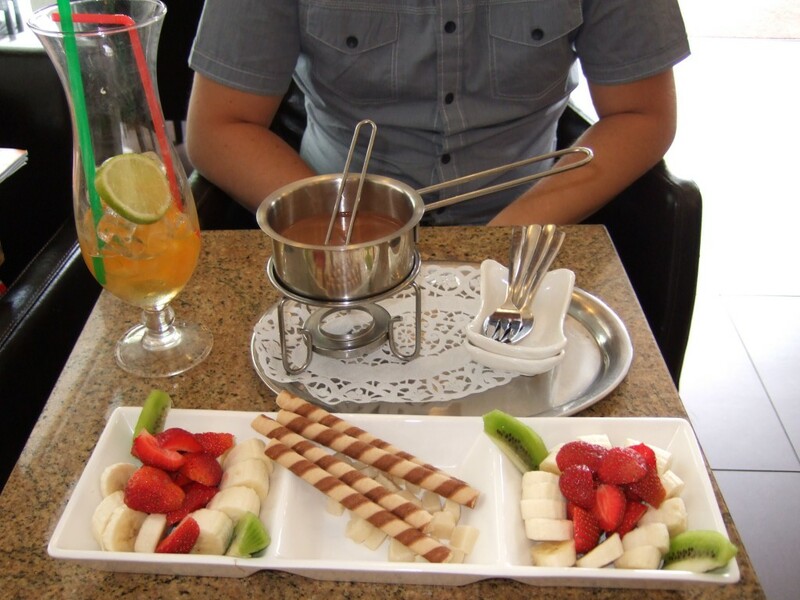 They had chocolate fondue, something I ordered many days while there. The boy in the picture below is not for sale, btw. That’s when I found out that I like liquid chocolate better than the hard kind. I got to try different fruits with chocolate fondue (more than what’s in the picture), but I found that I like bananas best. Strawberries works with chocolate as well, but I still prefer to eat strawberries for itself. Bananas and chocolate on the other hand works perfectly together. When I got home from vacation, the first thing I did was walking around Stavanger looking for the perfect fondue set. I went to many stores and were about to give up. Either the fondue set was too small or too big (and none of them were good-looking) until I finally found the perfect set! So this evening Espen made chocolate fondue for us with strawberries and bananas in the new set I had bought. It was perfect. Norwegian strawberries and Freia Melkesjokolade.We quickly found out that the milk chocolate needs to be diluted with cream before putting it into the fondue. The candle under the fondue heated up the chocolate too much so instead of becoming more fluid, it became lumpy. 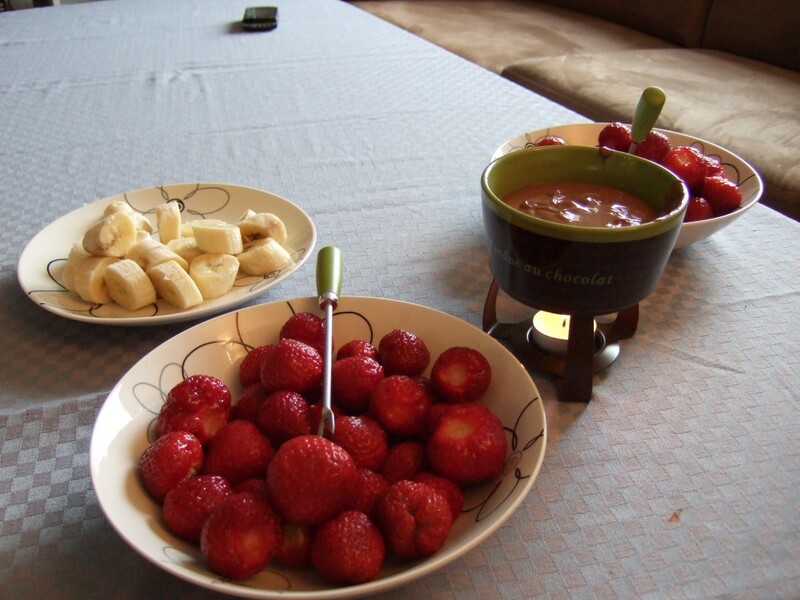 If you have any suggestions for other fruits to use with chocolate fondue – let me know. I’m up for trying. And doesn’t the fondue set look just perfect? I love the design. It was purchased at Traktøren. Good suggestions! I tried none of those, but I did try apples, kiwi, melons. Coconut and chocolate must be perfect together, but I’m not sure how to do that. Coconut meat is really hard. Hi Helene, The chocolate fondue looks delicious. Can’t wait to try some myself! Sounds like you had a really good time in Poland. Do many Norwegians go there for vacation?